The Lime: Van der Sloot confesses. Charges to follow. According to an AP report in USA today officials in Lima Peru will soon charge Joran van der Sloot, the Dutchman suspected in the 2005 disappearance of an American teen in Aruba, with the killing a young Peruvian woman in his Lima hotel room. 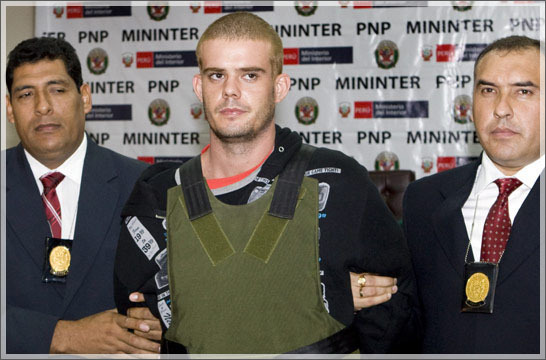 Peru's chief police spokesman, Col. Abel Gamarra, told reporters that van der Sloot admitted under questioning Monday that he killed Stephany Flores, 21, on May 30. Seems he left her to get some coffee and got pissed that she went in his computer and looked up pics and docs on his Aruba case. He came back, and got in such a rage that he grabbed her by the neck and hit her, police speculate with a tennis racket found in the hotel room. According to the paper, Flores was found beaten to death, her neck broken, in the 22-year-old Dutchman's hotel room. Police said the two met playing poker at a casino. Van der Sloot remains the prime suspect in the 2005 disappearance of Alabama teen Natalee Holloway, then 18, on the Caribbean resort island of Aruba, where she was celebrating her high school graduation.